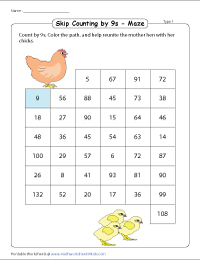 Skip counting is a basic math skill to learn addition and subtraction. 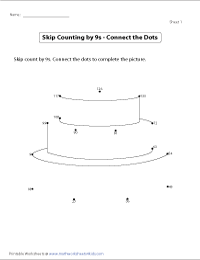 Skip counting by 9s worksheets are available here. 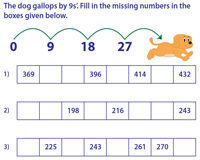 Skip counting is reinforced with different activities like number line, counting with pictures, complete the path, maze and connect the dots. 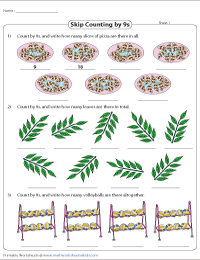 The following printable charts can be used to teach skip counting by 9s. Partially filled and blank charts have been included to practice skills acquired. Obtain a thorough knowledge of reverse skip counting by 9s with the display charts encompassed in this section. Try the partial and blank charts to test the knowledge gained. 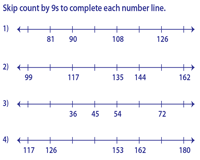 Each number line is marked at intervals of 9. Count by 9s to complete each number line. There are two levels of difficulty in this topic. 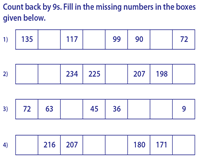 Children have to skip count by 9s to find the total. This activity helps them practice counting in 9s. 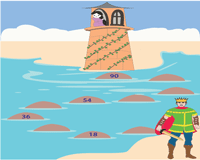 Skip count in 9s and plug in the missing numbers to complete the path in the themed worksheets. Students have to fill in the missing numbers on the spacecraft. It is done by counting in 9s. 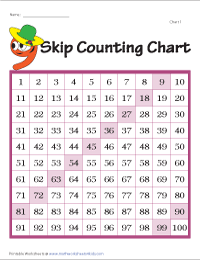 Skip count by 9s to fill in the missing numbers. There are 6 problems in each sheet. There are five problems in each worksheet. 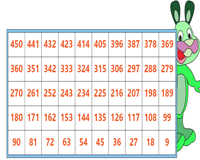 Children count backwards to fill in the missing numbers. Maze is a fun way of learning skip counting. Color the path starting from 9 to reach the target. 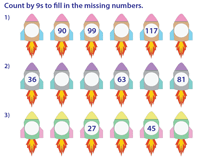 Connect the dots pages improve child's counting ability and motor skills. Skip count by 9s to unlock the picture.